A delicacy from the Chettinad cuisine, this Prawn Pepper Masala is best served with rice, roti, pulao or naans. 2. Fry the cinnamon, saunf and curry leaves for 30 seconds. 3. Add the onions and saute until golden. 4. Add the ginger garlic paste and stir-fry for a minute. 5. Add the green chillies and tomatoes. 6. Stir well and cook for a minute more. 7. Add the prawns, turmeric powder and salt. Add 2 to 3 tblsp water if required. 9. When the gravy starts to thicken and prawns are cooked, sprinkle pepper powder and coriander leaves. 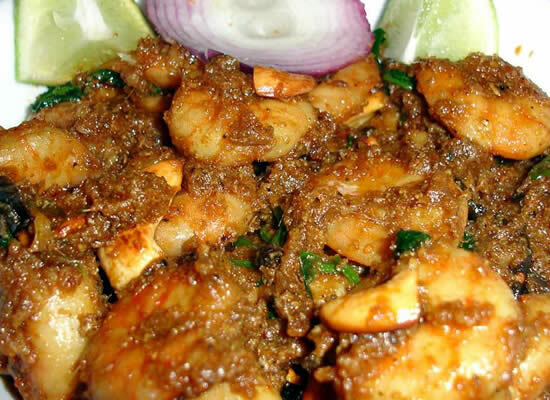 Feel free to comment or share your thoughts on this Prawn Pepper Masala Recipe from Awesome Cuisine.